Several years past I was driving along Saginaw Road in Midland, Michigan near Dow High School when suddenly I spotted a huge Elder bush partly hidden due to a deep dip in the landscape where she stood. I quickly parked my car and with basket in arm went to meet and greet her. I climbed down the gulley and found myself towered by her beauty and sweet scent. I was in awe. Never before had I found myself in such a powerful plant presence. I stood in admiration and appreciation for her calling me to stand beneath her arching limbs, heavily laden with clusters of large, white flower – absolutely breathtaking. My first encounter with Elder is forever in my memory and heart. A majestic Elder grows in my garden. Her presence is an ever welcomed joy. I love gathering her light and airy white flowers. You want to handle the flowers as little as possible for they bruise easily. I find that cutting the flowers without touching them and simply letting the flower clusters fall directly into a gathering basket works well. Here’s a look at an elderflower cluster in its unopened bud stage. It’s full of promise! 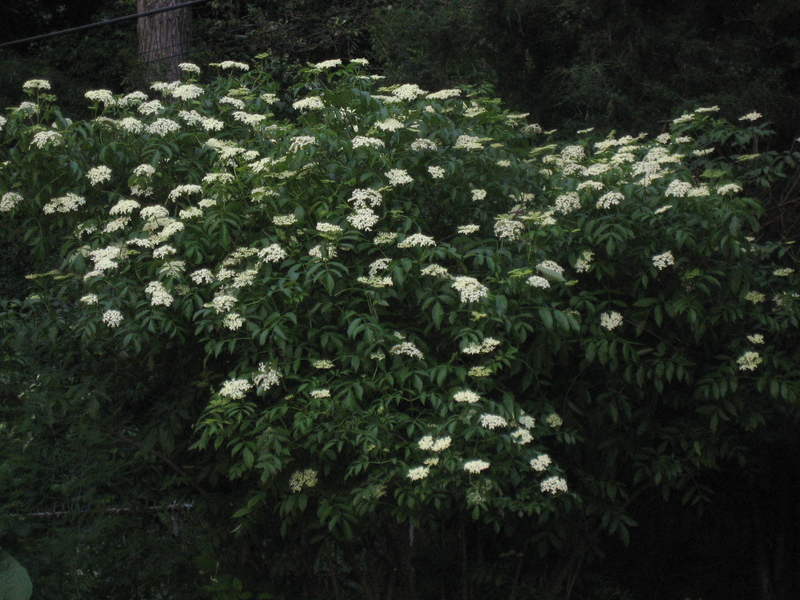 Elderflower cluster in full bloom! A gorgeous display of opened buds ready to harvest! The flowers resemble little buds when dried. The flowers will darken slightly as they dry, but this is natural. If I’m using paper towels or a basket, I clip the flowers from the stems onto paper toweling or baskets, leaving as little stem attached as possible. Once dried, you can simply fold the toweling in half and pour the dried flower buds (no stems) into a jar for storage. Another method is to turn the entire flower cluster upside down on dehydrator trays so the flowers are flat against the surface. I find the dried flowers are more of a pearly white using this method. 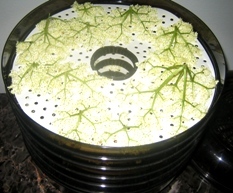 The downside is that the dehydrator doesn’t accommodate very many flowers. I’ve dried the flowers both ways and find that either way works just fine. I think the key is to handle or touch the fresh flowers as little as possible. A classic recipe uses elderflowers to make a hot tea blended in equal parts with yarrow (Achillea millefolium) and peppermint (Mentha piperita). As a side note, a “part” is simply your measurement of choice, e.g. tablespoon, cup, etc. In this example, the “part” is the same measured amount, e.g. tablespoon, for each herb in the formula. The yarrow helps the body move dry, hot heat held in the core of the body out to the skin or periphery of the body. I experienced yarrow’s diaphoretic action one evening during one of Kathy Eich’s classes on tissue states. I was feeling that kind of intense inner warmth where you just know your face is beet red. We were working with yarrow that evening and I sipped some yarrow tea. The heat in my body literally diffused up and out through my skin providing me with a sense of cooling relief. It is no wonder yarrow is part of this tea blend. 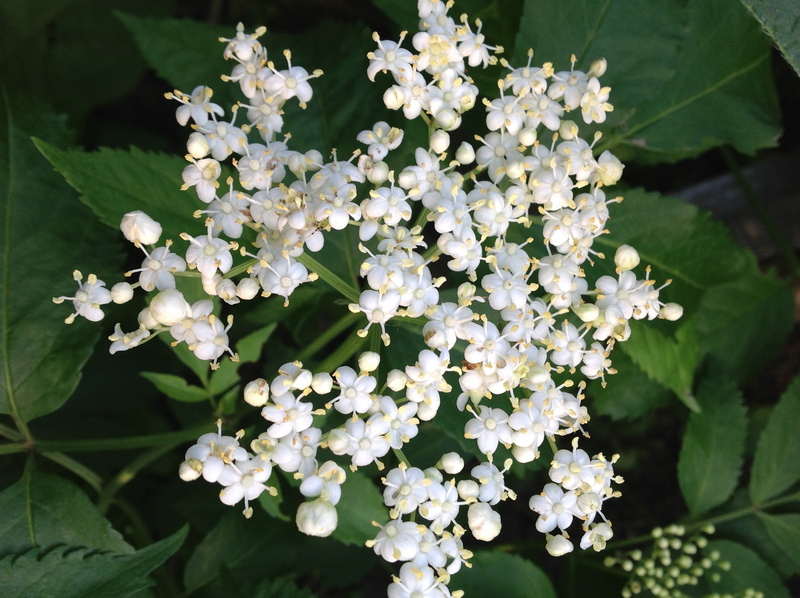 The elderflower in turn helps to open the pores to release the heat through the skin. The peppermint stimulates the movement of the heat through the body and relaxes it at the same to time so the skin can open and release. It’s understandable how this diaphoretic herbal blend became a classic remedy where there was a need to support the body’s sweating mechanism during colds and flu and fevers. You need to drink the tea hot to benefit from its diaphoretic action. 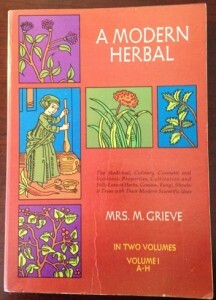 I enjoyed reading Mrs. M. Grieve’s description on elderflower’s benefits in A Modern Herbal, Volume I. ” The flowers were used by our forefathers in bronchial and pulmonary affections, and in scarlet fever, measles and other eruptive diseases. An infusion of the dried flowers, Elder Flower Tea, is said to promote expectoration in pleurisy; it is gently laxative and aperient and is considered excellent for inducing free perspiration. It is a good old fashioned remedy for colds and throat trouble, taken hot on going to bed. An almost infallible cure for an attack of influenza in its first stage is a strong infusion of dried Elder Blossoms and Peppermint. Put a handful of each in a jug, pour over them a pint and a half of boiling water, allow to steep, on the stove, for half an hour then strain and sweeten and drink in bed as hot as possible. Heavy perspiration and refreshing sleep will follow, and the patient will wake up well on the way to recovery and the cold or influenza will probably be banished within thirty-six hours. Yarrow may also be added.” I don’t know about drinking it in bed, but it certainly demonstrates why this herbal blend is a classic remedy! There is a ton of additional information on Elder that makes for a very interesting read. I consider it a classic resource on my book shelf. 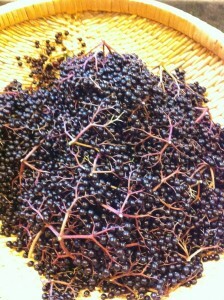 Let’s first talk about harvesting elderberries as a little background before we talk about making Elderberry Cough Syrup. 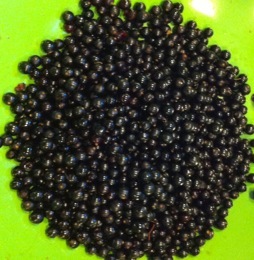 The tendency is to harvest the berries when they “appear” dark blue, but wait! They actually deepen into a dark blue-black berry. Then, they’re ripe for harvesting! Be sure to gather and dry the ripe dark blue- black berries in late summer on a dry day.You shouldn’t have any trouble leaving some berries for the birds. 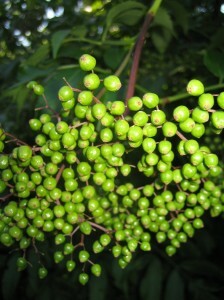 Elder grows tall enough with many berries out of reach of eager humans to provide for feathered friends as well! 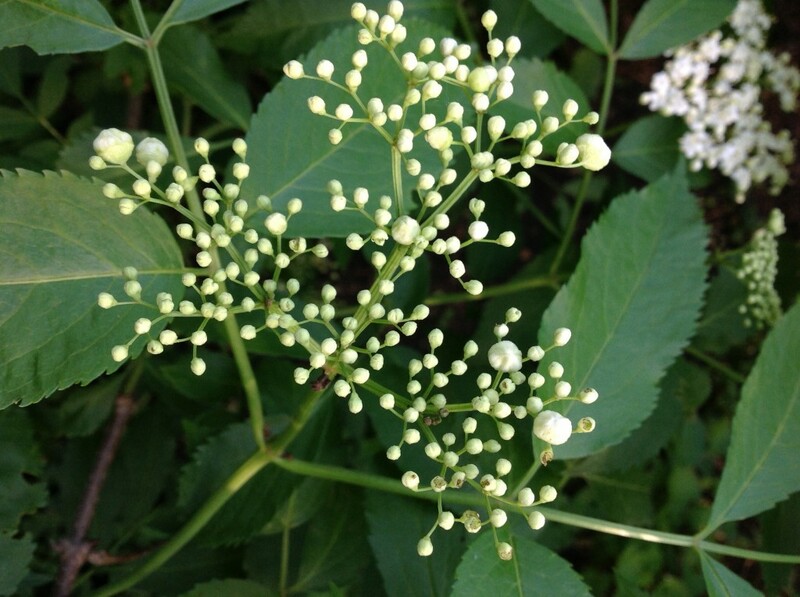 Ripe elderberry cluster – the flower cluster gone to berry! I clip the hanging ripe berry clusters so they drop into a gathering basket. The next step is to separate the berries from the tiny stems. This can take a little time, but it’s relaxing and connects you directly with the plant’s medicine, an invaluable part of healing and making potent medicine. I remove the berries from the stems and place them on a drying screen or flat basket-tray for good air circulation. Be sure to spread the berries into a single layer so they are not touching or overlapping. Tip: place the drying screen on top of your refrigerator. The berries will dry beautifully from the gentle warmth of the refrigerator. The berries shrink by almost a third! 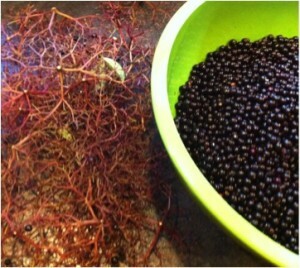 Elderberries removed from tiny stems. Make sure to dry the berries completely before storing them or you risk mold. Store the dried berries in a glass jar and keep in a cool, dark place. If you don’t grow elder or know where to harvest some, you can likely purchase dried elderberries at your local cooperative or a community pharmacy. And, there is always the on-line alternative, for example, Mountain Rose Herbs or similar quality on-line herb store. 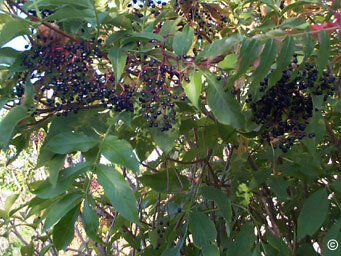 So, you may ask why all the praise for using elderberry syrup during the cold and flu season? 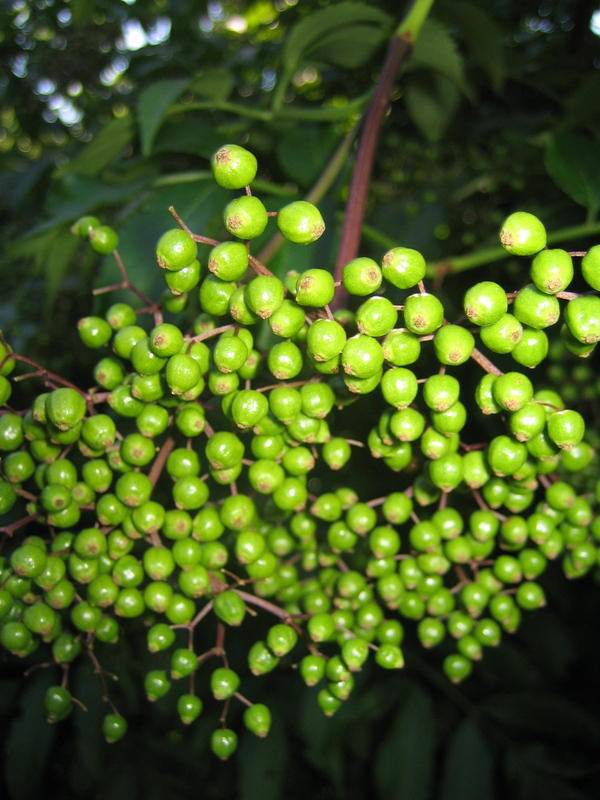 Elderberry has a long history of use for upper respiratory ailments associated with the colds and flu. An eye opener for me was reading in Buhner’s book, Herbal Antivirals, that elder “inhi bits viral replication”. David Hoffmann states that “the herb appears to strengthen cell membranes to prevent virus penetration, possibly by inhibiting the viral enzyme that weakens the membrane.” That’s why it’s important to get started with elderberry at the get go when you feel a cold or flu coming on. And, if that’s not enough power punch, elderberry is rich in antioxidants, though not surprising given the berry’s dark blue-black color. 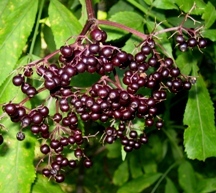 I also love that Elderberry cough syrup is one of the best general cough remedies, especially for children. It really is a “go to” family herbal remedy that I always make in early winter season so I have it readily on hand if and when I or another family member could benefit from it. Of course, you can buy elderberry syrup in the store, but you can make it for pennies less and you know exactly what is in it together with your caring love in making it. It really is a win win situation. Below is a classic elderberry cough syrup recipe I found in Rosemary Gladstar’s Family Herbal several years ago. There are many similar ones out there as well that include additional spices like ginger and cloves. I find Rosemary’s recipe a tried and true one to start. I make this Elderberry Cough Syrup at the start of every winter season. There are numerous other ways to make elderberry concoctions which are fun to make, but for now we will just start with a basic recipe. When you’re feeling sick and fatigued it’s hard to think about making anything, even if it’s easy to make. So, I’ve found it helps to make a batch early winter and keep the syrup in the refrigerator. That way, if I find a nasty head and chest cold coming on, Elder is waiting and brings welcomed relief. found in Rosemary Gladstar’s Family Herbal. I’ve added extra brewing notations in parenthesis based on personal experience. Place the berries in a saucepan and cover with water. Bring to a boil, reduce heat, and simmer over low heat for 30 to 45 minutes. Bottle the syrup and store in the refrigerator, where it will keep for 2 to 3 months. Caution: Use only blue elderberries; the red ones are potentially toxic if eaten in large quantities. Never eat elderberries that haven’t been cooked first. Label the bottle with name, date, source of your berries, ingredients and the statement NOT FOR CHILDREN UNDER THE AGE OF ONE due to the honey content. Rosemary Gladstar does not list a suggested amount to use in recipe. Rosalee de la Foret, Methow Herbs, suggests that adults take 1 – 3 tablespoons each day to prevent colds and the flu. Children can take 1 – 2 teaspoons a day. However, she goes on to say that to shorten the duration of an illness take liberally at the first sign of a cold or flu. This coincides with Stephen Buhner’s suggestion is his book Herbal Antivirals. It is more effective to take frequent doses of elderberry syrup throughout the day than to take a couple of large doses infrequently spread out during the day, in particular at the onset of the cold or flu. JUST SOME OF ELDER’S HELPFUL WAYS . . . . Renowned for its ability to prevent an upper respiratory infection as well as shorten duration of a cold or flu. Immune modulator (adjustment of the immune response to a desired level). A true modulator will effectively regulate an underactive or overactive immune system back into normalization. One of the best general overall cough remedy, especially with children. Grieve, Mrs. M. A Modern Herbal, Volume I. Dover Publications, Inc., New York. 1971 (originally published in 1931).